SELCAT – Southeastern Line Constructors Apprenticeship & Training – is a local educational program affiliated with the National Joint Apprenticeship & Training Committee (NJATC) and trains a local workforce of Linemen – at no cost to taxpayers while also providing earn-while-you learn education! 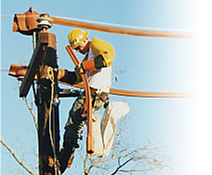 SELCAT provides standardized, fully certified and up-to-date training for workers who keep the Outside Electrical Construction Industry in the Southeast United States strong and the region powered. Specifically, SELCAT services Alabama, Arkansas, Florida, Georgia, Louisiana, Mississippi, North Carolina, South Carolina and Tennessee. Please read about the SELCAT MISSION for additional information.